Blessed with an innate optimism and a magical childhood, Elisabeth Belle Sterling discovers that the path to happily-ever-after love is not as easily obtained as she had always imagined. The Camelot-like love she longs for seems like only a dream until she meets the handsome Kincaid Patterson, a West Point graduate who carries a dark secret from his past. Theirs is a passionate and unconditional love that has to confront a painful past, heart-searing separation, and the greatest of all tragedies. But the biggest obstacle is the loss of faith that threatens to undermine all that they have. 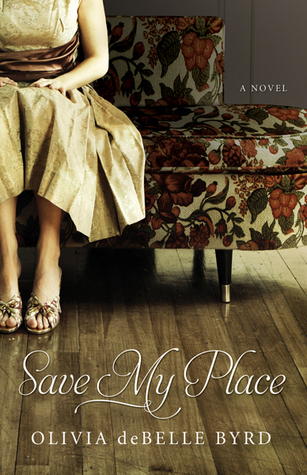 Set in the South during the 1960s and 70s against the backdrop of the Vietnam War, Save My Place is a beautifully written love story of two people who search deep within their souls to save each other. The book starts with Elisabeth being dumped and deciding to become an old maid. She then applies to he University of Georgia to get a masters degree in education. Then she meets Kincaid and her old maid idea flies out the window. The author writes in a style that makes you feel like these people are your friends. I loved all the characters, especially Elisabeth and Kincaid. The love they felt for each other was immense, and they also loved the people in their lives very deeply. The book is full of emotions. It’s funny, sad and also heartbreaking. It shows how love can conquer all, and bring people who have been torn apart by a tragedy, back together. And, you’ll have to read the book to find out the special meaning of the title, Save My Place. I would recommend this book to anyone who loves a bit of romance, relationships, or southern fiction. It’s a short book and I read it rather quickly, but it left a huge impact on me and is one I would like to re-read in the future. This book is one of my favorites of 2015, as is her 1st book, Miss Hildreth Wore Brown: Anecdotes of a Southern Belle (my review). I can’t wait to see what she writes next. Thanks to the author for this review copy, and for being so patient with me while I was trying to catch up on reviews. Vicki, this book sound wonderful, uplifting! Terrific review. I can see why you liked this one, Vicki. So much packed into a few pages and yet to meaningful. I will have to look for this one. I’m glad to see you liked it. I’ll have to keep it in mind since I really liked Miss Hildreth Wore Brown. Happy new year!